Installation view of Jana Euler’s 2012 show at Real Fine Arts in Brooklyn. For nearly a decade, Real Fine Arts made New York City a much more interesting place. Tyler Dobson and Ben Morgan-Cleveland, both artists, opened the gallery in December of 2008 on the ground floor of an apartment building in Greenpoint, Brooklyn, at 673 Meeker Avenue, right next to the noisy Brooklyn–Queens Expressway and across from a Staples office-supply store and a McDonald’s. It was an improbable location for such a business, but over the course of about 100 shows, performances, and presentations at art fairs, RFA played host to some of the most thrilling artists of the period and, in the process, became one of those very rare venues that helps define a particular moment in art. A work by Georgia Sagri underneath the BQE in 2011. On Monday evening, the gallery announced its end with a simple five-word email: “Real Fine Arts is closed.” Its final show, with Bernadette Corporation cofounder Antek Walczak, who had three one-person exhibitions with the gallery, concluded on March 10 at the Grand Army Collective building on the border of Prospect Heights and Park Slope, to which RFA had moved last fall. Once asked by Interview magazine if RFA had a “signature style,” Dobson and Morgan-Cleveland responded wryly: “Not a style, but a vibe. It’s a little off-the-wall, but don’t get us wrong, the artists are all very sophisticated.” The art they showed was united by a kind of scrappy elegance and insouciant intelligence. A bit out of the way but closely watched by artists, the space they ran invited artists to experiment, and each new show felt like an event. Georgia Sagri strapped dog transporters to the underbelly of the BQE as makeshift bird’s nests and chained garbage cans to the outside of the gallery for her exhibition in 2011. Later in the year, for an installation that was open only in the afternoon and evening, Sam Pulitzer attached five bright-green tactical laser lights to the ceiling, crafting a display that felt part death metal, part surveillance state, and part Mission Impossible. In the spring of 2012, Yuji Agematsu pinned bits of trash to the wall like so many extraordinary butterfly specimens. The next year, Mathieu Malouf laid down bright red carpeting, painted the walls the color of citrus, and affixed collars and chains to his sculptures, staging a delirious fin de siècle dungeon. Installation view of Yuji Agematsu’s 2015 show at RFA. Clicking through the RFA website, I was astounded to be reminded of how much incredible art appeared there over the years. There were the ghostly, wonderfully left-field sculptures of Lena Henke that look at architecture and urban history with wily humor in two shows (those ceramic horse hooves with plastic milk cartoons! 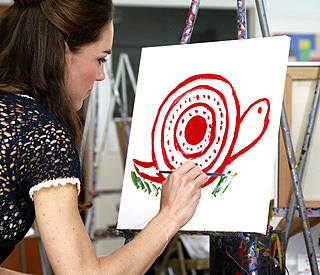 ); the bizarre suite of Michael Krebber paintings based on a work that Kate Middleton made of a snail at a Los Angeles fundraiser (is it a coincidence that the gallery announced its closure on the day that the Duchess of Cambridge gave birth? ); the utterly charming fish-tank dioramas of Maggie Lee; and the bewitching paintings of Whitney Claflin, who hired a remarkable Justin Bieber impersonator to do a one-night stand. At a time when so many galleries—whether fledgling or established—build rosters that seem most concerned with having a little something for everyone, RFA instead opted for a program that felt focused and selective. One of my great regrets is that I didn’t get to see it all. I only started visiting in early 2011, so I missed early projects like the 2010 group painting show put together by Dave Miko that involved him splattering paint over the works, as well the first and only shows at the gallery by Dobson, Colby Bird (who showed only a sofa), and Asher Penn, plus a midnight performance by Kayla Guthrie in April of 2009. Installation view of “Ben Morgan-Cleveland: Salvation Armani” at RFA in 2012. Two very different shows from the stretch that I did see feel particularly emblematic of RFA’s sensibility. The first: German painter Jana Euler’s stunning solo exhibition in the spring of 2012 (her debut in the U.S.), which included four of her luscious figurative paintings among semi-opaque scrims. The second: the next exhibition, for which Morgan-Cleveland blocked out the gallery’s windows save for a tiny hole that allowed light to flicker into the room, so that the action of the street appeared upside-down on those screens. It was a clever, unexpected, economical move—a bit disorienting and quite beautiful.